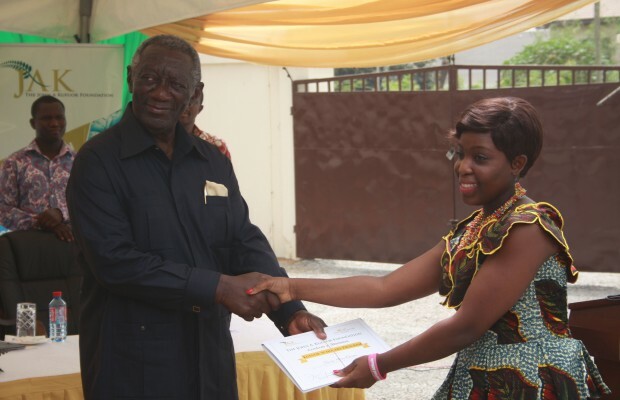 Former President John Agyekum Kufuor has officially inaugurated the Kufuor Scholars Program (KSP) to provide specialized orientation through program mentorship, skills and experiential activities as well as annual stipends to young people in the tertiary level. According to Mr Kufuor who is also the Chairman of the John Agyekum Kufuor (JAK) Foundation, the KSP which was instituted by JAK Foundation, was expected to produce leaders imbued with unwavering sense of patriotism; leaders who are innovative, problem solvers, creative thinkers and knowledgeable in their respective fields of endeavor. Speaking at the inauguration ceremony at the head office of the JAK foundation in Accra yesterday, Ex-President Kufuor said it had been his long cherished dream to nurture young people with ambition and leadership qualities. “I am delighted because it has been my long cherished dream to nurture young people with ambition and leadership qualities, ready to assume the control of affairs of whatever industry they find themselves in. This could be in politics, business, academia, sports, religion, culture, administration, health and technology among others,” he stated. Over 500 applicants from tertiary institutions who were expected to have completed their first year course were screened by various intellectuals of high repute and great experience – independent of the foundation-. They were pruned to 50 and then to 20 and after another interview session 14 brilliant young applicants emerged. Each of the 14 selected candidates would receive an annual stipend of GH¢10,000 for 3 years. The former President urged the candidates to prove themselves worthy as missionaries and ambassadors to serve as the stems on which branches would grow for the good of the nation and the African continent. Prof Baffour Agyeman-Duah, Chief Executive for the John Agyekum Kufuor (JAK) Foundation noted that the program would prepare the 14 candidates to become responsible and effective leaders in any position they find themselves in the future. The event brought together a host of personalities like Erling S. Lorentzen, Prof. Audrey Gadzekpo, Dr Pascal Brenya, Henry Baye, Dr. Kwame Addo Kufuor, Kwadjo Mpianim and Dr Mary Chinery Hesse among others.